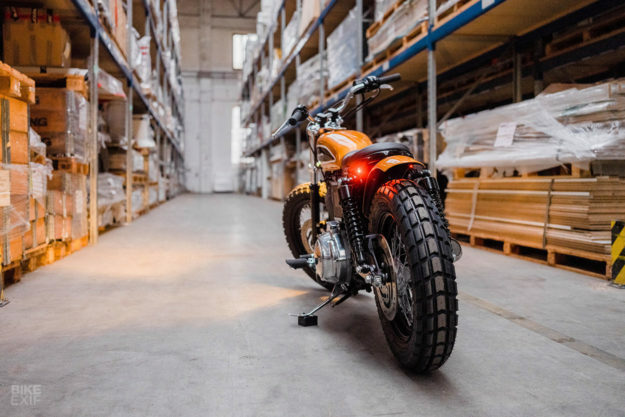 Quite a few bikes have quirks that can trap the unwary builder. 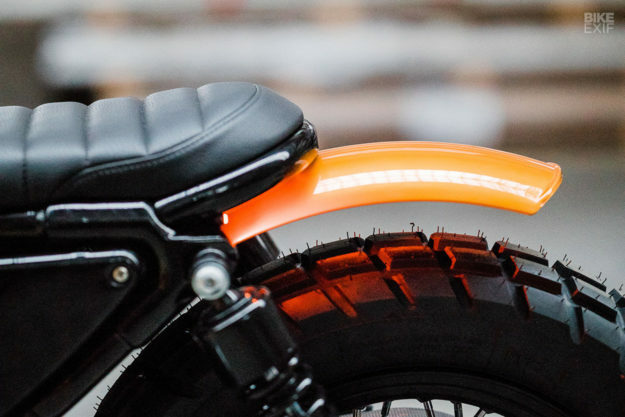 The strange frame curvature on the Honda CX500 is one of them, and the height of the Harley Sportster motor is another. 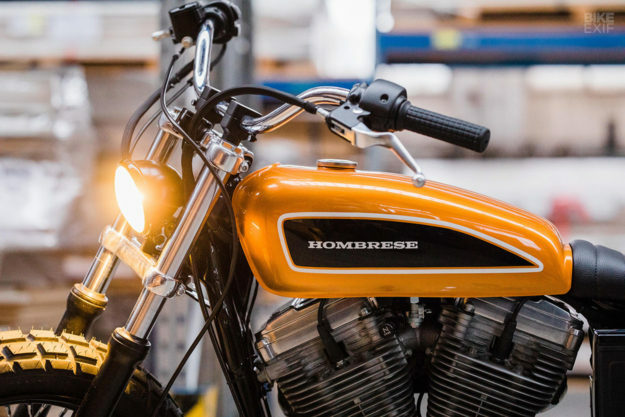 The venerable V-twin is an unusually tall engine, which makes it difficult to get a straight line from the base of the tank to the back of the seat. And it’s even harder to create a low-slung, slammed effect. But Uwe Kostrewa has managed to pull off both tricks, and deserves a round of hearty applause. 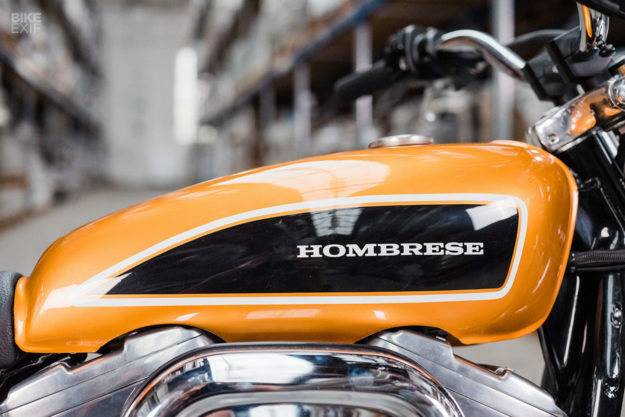 Uwe hails from Cologne in western Germany, and operates his workshop as ‘Hombrese Bikes.’ He’s been building for six years, but burst onto the scene a couple of years ago with a colorful W650 tracker—complete with bright blue powder coated frame. 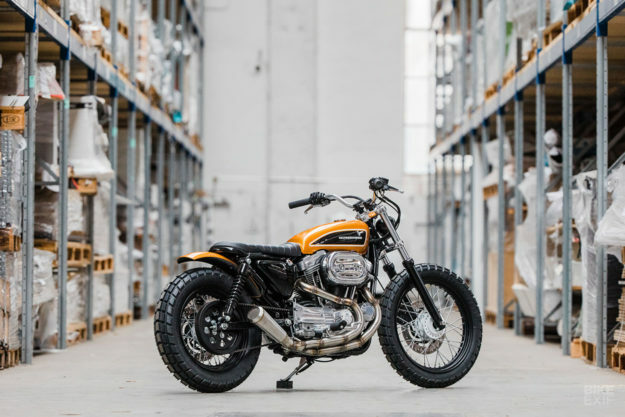 Uwe’s Harley is a 2003-model Sportster 883, with an economy and purity of line that makes us think of the best Japanese shops. 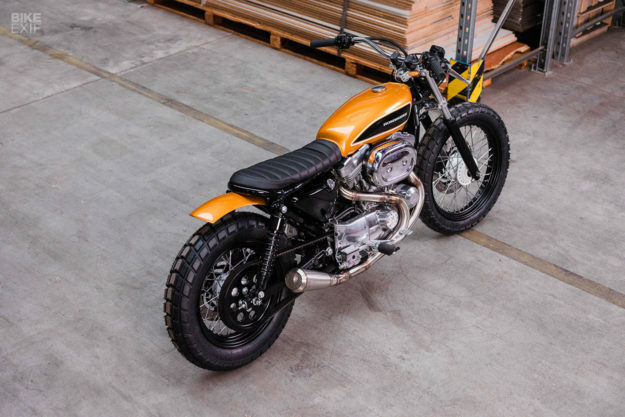 “I think the style is a mix of scrambler, tracker and a little bit of Brat,” says Uwe. It ticks all those boxes for us, and a few more: when the images came in, we pored over them, trying to figure out how Uwe got such perfect stance. Uwe has kept the stock fork tubes but installed new internals, including springs that reduce the ride height by 30 mm (just over an inch). At the back, new shocks from Progressive Suspension provide a handling upgrade. 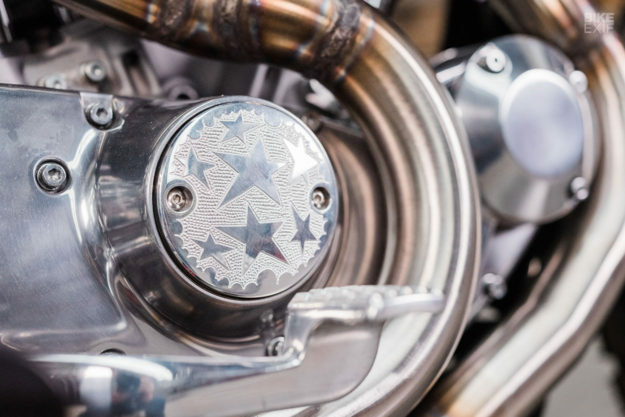 The Sportster was extremely well maintained by its previous owner, and the brake system was in perfect order. So Uwe simply refinished the wheels with new spokes and powder coated rims, and installed Bates Baja tires—inspired by the famous Goodyear Grasshopper, and produced by Heidenau. Then it was time to work on the body. 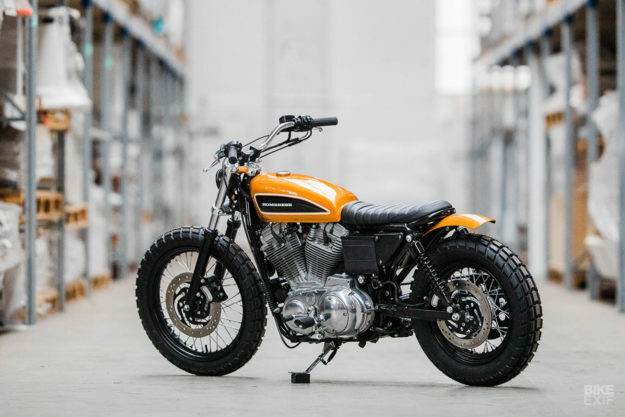 The tank was critical: the classic custom ‘peanut’ style simply wouldn’t work here. So Uwe picked out an old Honda tank that was hiding in his workshop, and started modifying it. After getting the Honda tank to sit right, Uwe turned his beady eyes to the back of the frame. He cut off the stock tubing, and built a new loop that’s screwed on from the inside. 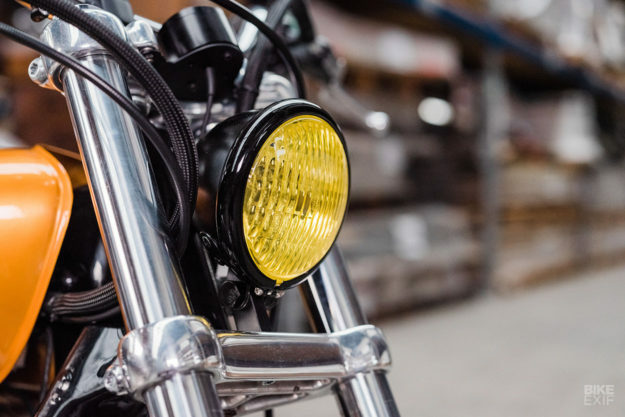 The ancillaries are a discreet mix of old and new: a classic 4½-inch headlight at the front, and tiny Kellermann Atto indicators all round. 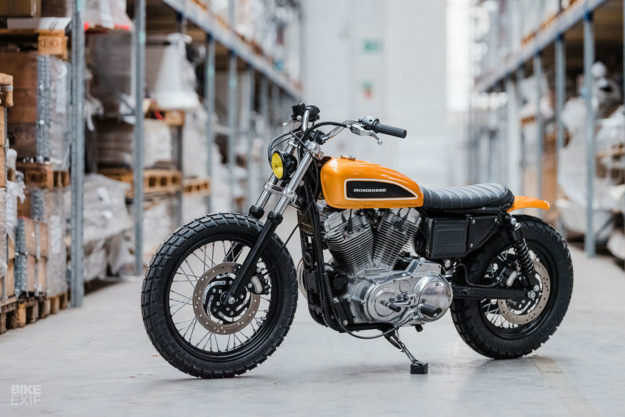 The bars are from an older Harley and fitted with vintage-style grips, but the speedo is a thoroughly modern Motogadget Motoscope Tiny. 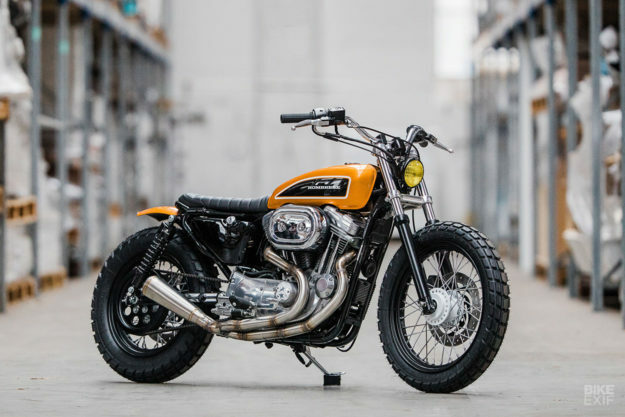 After the classic Harley-Davidson orange paint had dried on the tank and the aluminum rear fender, Uwe bolted the Sportster back together. We’re guessing he took a moment to step back and admire his handiwork. 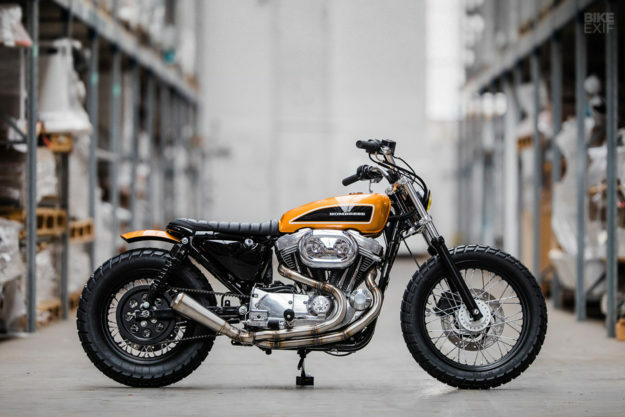 And we hope he felt deep satisfaction, because the style and stance of this Sportster is absolutely spot-on.